That includes on boards! 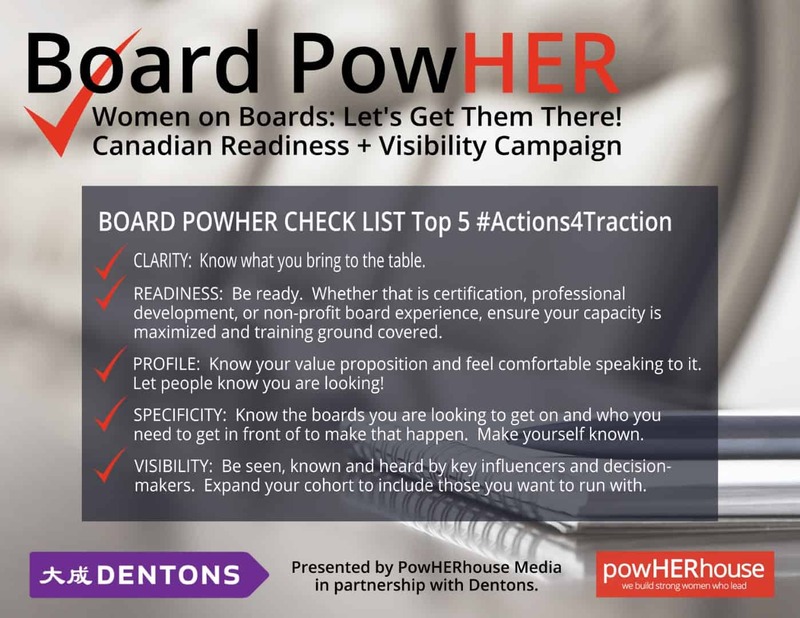 We are grateful to be working with Dentons on a new media initiative called Board PowHER! Board PowHER is a Canadian Readiness and Visibility Campaign for female leaders. In partnership with Dentons, we are excited to move the conversation of Women on Boards forward. Watch our first Board PowHER webinar here facilitated by PowHERhouse CEO Charlene SanJenko, featuring panelists Heather Barnhouse, Partner at Dentons; Kellie Garrett, CEO at Kellie Garrett Enterprises; and Cathy Warner, Saskatchewan Marketplace Leader at Deloitte. Why is this an important conversation to have? Charlene SanJenko - We want to encourage dialogue about (Canadian) women on boards. Where are we at? Where are we still getting stuck? How do we take the conversation to the next level? Heather Barnhouse - We need to provide advice around board governance including women on boards and best practices. WomenLEAD (internal Dentons organization for mentoring junior execs). Kellie Garrett - “Recovering executive,” now runs her own business as an executive coach, speaker and consultant. She never let gender define her, but statistics say it’s hard for women to get on boards. We need to remove barriers for other women. Cathy Warner - The metrics aren’t changing. We have to get tactical and understand what the bar is to get on boards, as the bar gets higher. What specific actions/tangible steps do we need to take to get us more Board-ready? Where do non-governmental boards fit in? Char - We don’t want to replicate or duplicate efforts. We have a lot of work to do. Heather - Don’t get discouraged. Keep an open mind. Ask yourself and know what you bring to the table/a board. Explore uncommon or not necessarily known tactics. Lifelong learning approach. Look at governance training. Be aware of best practices. Cathy - Understand what you bring. Develop a thoughtful CV. Boards all have skills matrices and diversity [requirements]. Work diligently to fit into some of those boxes. Continuing Education - do some workshops if not full ICD (Institute of Corporate Directors) certification. Expand your cohort. Cohorts run together. Kellie - Know your value proposition. Make sure it matches others’ assessments. Know that your reputation precedes you. Have a director’s CV - understand what the board competencies are. Networking is hugely important. Vast amount of board appointments are still through WHO you know. How important do you think Networking and Visibility are in this discussion? Char - Networking: Get specific. Know which boards you're aligned with and then look at who’s on those boards and who in your network knows those people. Get strategic. Strategically know HOW to get in front of WHO you need to get in front of, to make the next steps happen. Visibility: Profiles. Some U.S. groups are doing a good job of profiling women who are looking for board positions and celebrating women who get into board positions. Clarity - we have to get really clear on what we bring, our own profiles. Kellie - Both are important. Networking - I’ve focused my networking on professional development and ICD meetings. It’s also parties. Tied to the value proposition is the ‘elevator speech’ = three key points. Let people know you’re looking. Visibility - There are initiatives to get minorities on boards, incl. women, people of colour and with disabilities. This opens up additional support. Volunteer boards - you never know who will be on those boards. Cathy - Both are important. Building CV and going to events are important. Talk to / connect with board members. When the time is right, think about WHO. It’s about the cohort. Heather - Know your training ground. It can take time to get on corporate boards. Don’t downplay a not-for-profit board. It can be a training ground or launch pad. Don’t underestimate it networking-wise. Know who’s ready and available to sit on boards. Be proactive and have a (succession) plan in place. Know how the board will move forward. Visibility is important but not as much as networking. ‘Pale, stale males’ have difficulty getting on boards too. Char -Dance between readiness and visibility. Know where you’re at in the Leadership Ladder: I have policy and board experience and I’m going to get a strategy in place and build my visibility. Know who you’re ready for: I’m going to choose five boards, not just hope to get on a corporate board. I’m going to know which boards I want to get on and really lean on my network to get me in front of who I need to get in front of so they know who I am, what I’m ready for, what I can add to the board. Kellie - Remain optimistic. It is a journey for all. Remember your reputation precedes you so make it as good as you can. Dress the way you’d want to be perceived if you ran into someone who could get you on the next board. Women can go terribly wrong with image. Cathy - Pay attention to who’s on the board from a gender-diversity standpoint. If you’re targeting boards, look for who’s got the ‘three women.’ Think of how you’ll act when you get on the board. Give yourself permission to use your diversity. Know the reason you’re there is because you think differently. Heather -Customize and distinguish your CV. Know what you bring + know your audience. Don’t be afraid to ask the board for customized learning. ICD has lots of resources, templates, etc. Don’t be afraid to stalk the boards you want to get on. Make it known you’re looking. Show you’re not sitting waiting but active, attend events. Please join us on September 21, 8am PDT for Board PowHER II, our follow-up webinar to continue the conversation. Register for our webinar series HERE.